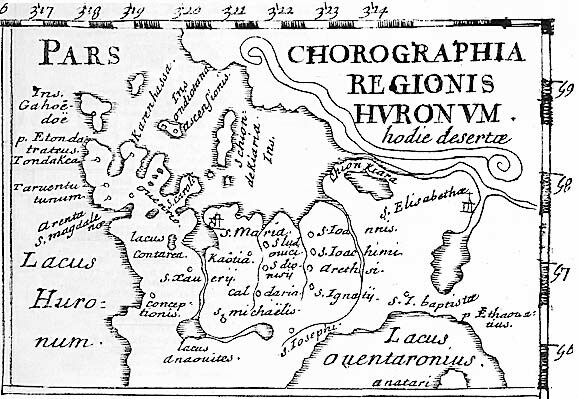 Huronia Chapter - Ontario Archaeological Society: So just what lake did Champlain pass by on his way to the Narrows? So just what lake did Champlain pass by on his way to the Narrows? If we read the following text of Champlain (as written in 1619 about his 1615 expedition) just what lakes is he describing and therefore in what direction should we be looking for Cahiague? "The greater portion of our men having assembled, we set out from the village on the first day of September, and passed along the shore of a small lake, distant three leagues from the village, where they catch large quantities of fish, which they preserve for the winter. There is another lake, closely adjoining, which is twenty−five leagues in circuit, and slows into the small one by a strait, where the above mentioned extensive fishing is carried on. This is done by means of a large number of stakes which almost close the strait, only some little openings being left where they place their nets, in which the fish are caught. These two lakes discharge into the Mer Douce." ok, it seems clear that the stakes refers to the Narrows. so does that then lead one to suspect Lake Simcoe and the smaller being Lake Couchiching? Mer Douce is Georgian Bay? Or is the smaller lake, Bass Lake? IF it is Bass Lake, a three leagues range would reach Warminster. Mer Douce is Georgian Bay - Bass Lake does not flow into Georgian Bay nor does it have a larger lake leading into it. So how can we think that the "small lake" referred to was Bass Lake? The language seems clear to me, the small lake being referred to would have being lake Couchiching. How narrow were the Narrows?